We are so thrilled to announce that Weswit, the company behind the Lightstreamer product family, has been renamed as Lightstreamer. Weswit pioneered the real-time web since the early 2000s and its flagship product, Lightstreamer, has become the absolute leader among commercial products in the Internet messaging space, in terms of market share. The Lightstreamer brand is now very well known globally. It makes total sense to identify the company and the product with the same name, for the sake of clarity and simplicity. We are now growing our product family, enlarging our team of brilliant engineers, and starting up brand new ideas. Innovation remains the key to all that we do. Our fabulous new headquarter at Copernico, in Milan, Italy. 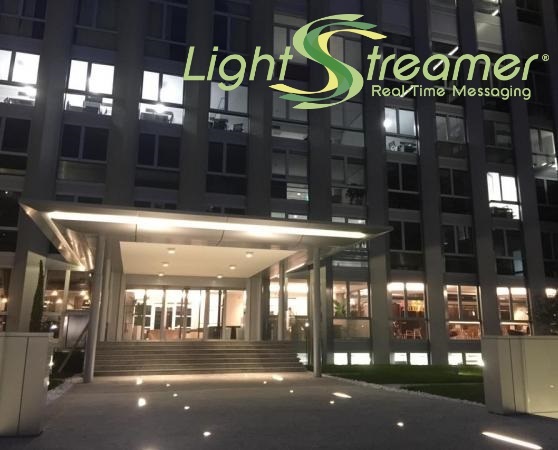 Now, when dealing with real-time messaging and data streaming, a single word needs to be remembered: Lightstreamer! When the iOS SDK came out in 2009, our choice at Lightstreamer was to build a new client library from scratch. We took as a reference the Java client library and started developing an entirely new Objective-C codebase, trying to merge the best object-oriented design we had at that time with a new language and environment. This had both advantages and disadvantages. On one side, native integration with iOS led to good performance and useful features, like network availability monitoring to avoid battery drainage. On the other hand, the slow process of discovering and fixing corner-conditions and bugs, which the Java library had passed through already, had to be repeated all over again. Moreover, as new features were introduced in the server, they had to be introduced in the client libraries multiple times. For these reasons, when the opportunity to rewrite the iOS client came in, we decided to try a different approach: transpile (i.e. trans-compile) a single Java codebase, in common with the Java client (now mostly dedicated to Android) and fill in the gaps with well designed wrappers and dependency injection. We explored this possibility before, but tools were not mature enough. Now they are, trans-compilaiton is a reality thanks to j2objc, an impressive tool made by the Google team, and transpiled code works and performs very well. So, today we are proud and excited to announce the availability of the alpha version of iOS and OS X client libraries version 2.0, both developed from a highly engineered codebase in common with the Java/Android client. The library's core is written in Java, transpiled to Objective-C and then wrapped and integrated with especially written native code, providing a natural and seamless interface to iOS and OS X developers. Let's see how it works and how to port your code. Note: if you need download and example pointers, jump directly to the end of the post ("Get the SDKs").